What would YOU do with a Time Machine? Would you stop the sinking of the Titanic? Prevent the assassination of JFK? Kill Hitler before WWII? 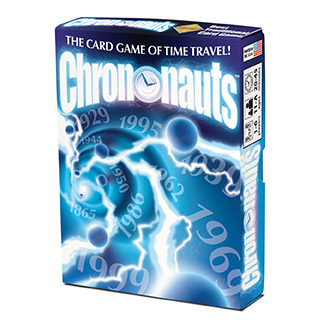 These are just a few of the possibilities in Chrononauts, the award-winning card game of time travel. To win, you must change history at key points called Linchpins, so that history transforms into the Alternate Reality your character calls home. You can also win by collecting a specific set of Artifacts, such as a live dinosaur, the Mona Lisa, and an unpublished Shakespearean play. But be careful - if you create too many paradoxes, you could destroy the entire universe. In this game, you are a Time Traveler, with a Secret Mission, a Secret Identity, and a very important job to do: Paradox Repair. You can win by fixing enough Paradoxes, gathering up the three rare and amazing Artifacts listed on your Mission card, or adjusting history in the three ways necessary to allow your character to return to the alternate reality from which he or she originally came. The constant changing of history is tracked by a special layout of 32 cards, called the TimeLine, which functions rather like a gameboard. The three ways to win provide for several different plotlines and layers of action, but you can also split the game up into two less complicated games: Solonauts (The Solitaire Game of Changing History) and Artifaxx (The Fluxx-style Game of Collecting Amazing Stuff).